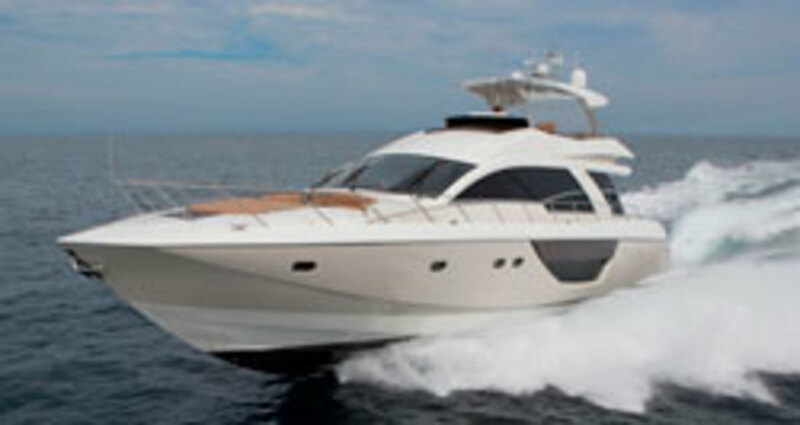 Power & Motoryacht's boat test of the Cheoy Lee Alpha 76 Flybridge. 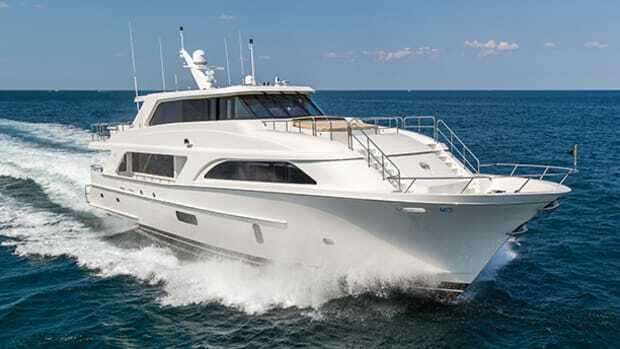 The upper helm of Cheoy Lee’s caterpillar-powered Alpha 76 Flybridge offers senior editor Kevin Koenig a glimpse into the future of a venerable shipbuilder. There were once seven brothers who ran a business of great merit and acclaim, that had been in existence for as long as anyone could recall. They had met great success building sturdy ships for the world’s wealthiest and most intrepid men, ships designed to take those men to the ends of the earth. But in time, one of the brothers moved far, far away, to a home in a distant land that was flush against the sea. And there he sat for days on end gazing out at the ocean, watching the boats come and go, come and go, until one day a realization struck him like a thunderbolt. We need to spread our wings. We need to stray from tradition. We need to do more. 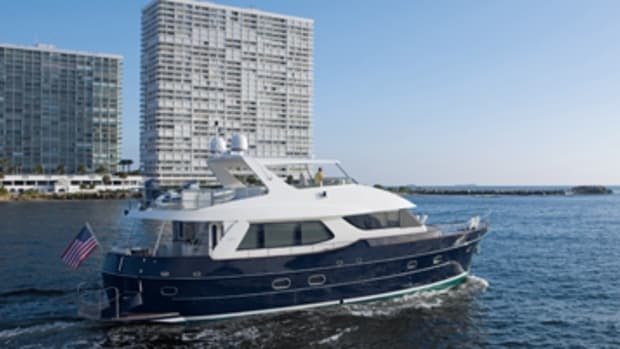 Some creation myths are apocryphal, but the Cheoy Lee Alpha 76 Flybridge’s is not. The seven brothers are part of the Lo family, who founded the shipyard in Shanghai 140 years ago. After entering the North American market in the late 1950s, the yard became known for traditional, bluewater sailboats and eventually long-distance trawlers. 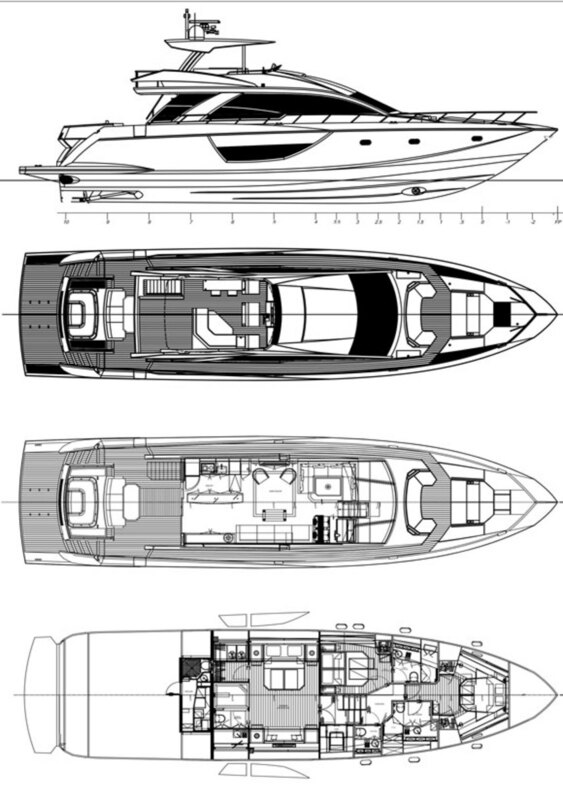 During the 1980s the yard transitioned into larger, more modern powerboats designed by naval architect Tom Fexas, carving out a respectable niche for the next three decades. Recently, however, one of the brothers, B.Y. Lo, moved to a condo on a Florida inlet, and watched the boats exiting and entering the port day after day. He saw so many performance- oriented express and flying-bridge cruisers that he realized there was an opportunity for Cheoy Lee to spread its wings and expand into that market. Thus, the Alpha Series. It is ironic that the 76’s beginnings can seem like an ancient, epic tale, because the boat herself is more like a futuristic spaceship. She is every bit of her 76-foot 1-inch LOA, but at the same time, she retains an undeniable sleekness in her lines. 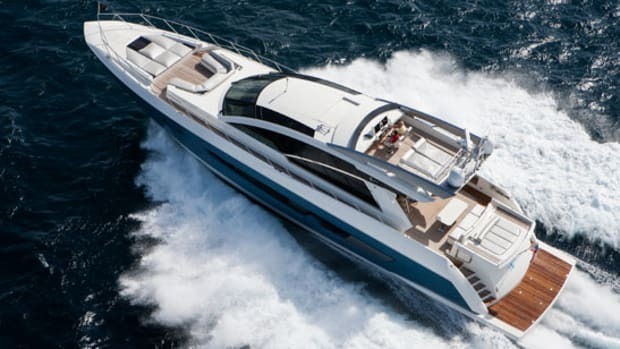 The yacht’s design is rounded somehow, and if truth be told, upon first sight reminded me a little of the teardrop-shaped UFO in the semi-classic 1986 film Flight of the Navigator—and believe me, as an ’80s baby, I mean that in a sincerely positive way. 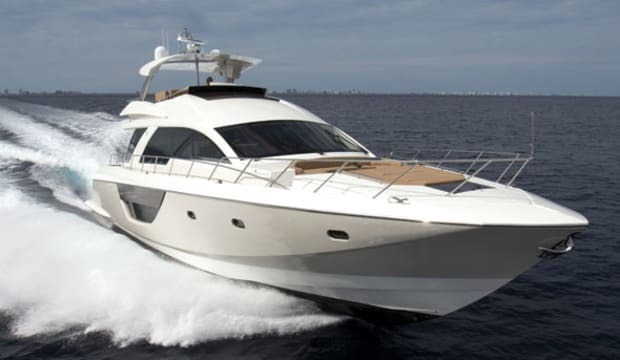 This 76 is essentially an express cruiser with a flying bridge on top. 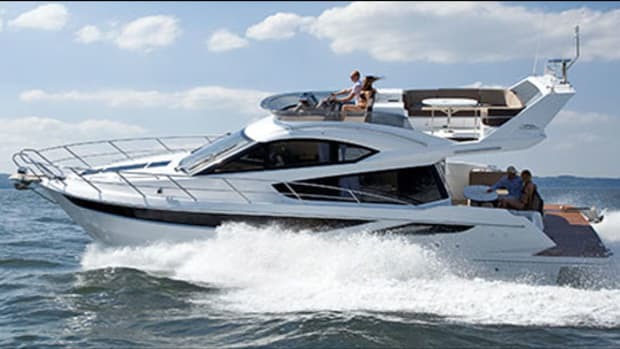 The boat has the same Michael Peters-designed hull as the Alpha 76 Express, but adds a relatively light, 3,500-pound bridgedeck. 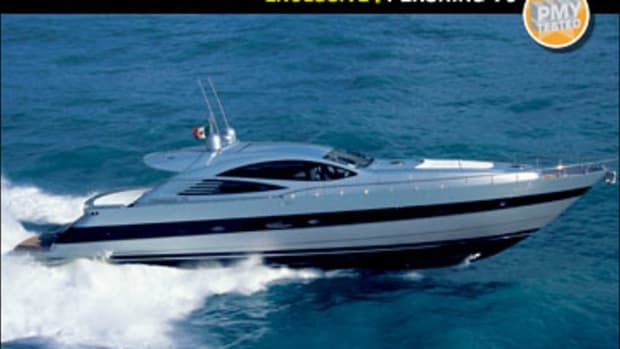 She’s also tricked out with all manner of gadgetry and design that shows that the Alpha series really has this cruising-boat thing down. Case in point, one of the very first things my test boat’s project manager showed me during my tour was the 76’s tender garage. That’s sort of an odd place to kick off a boat test mind you, so I figured it must be pretty good. Surprise! It was. The garage holds a Williams 285 RIB rigged up on rails that tip up hydraulically, so you can slide the tender out past the swim platform and into the water in all of 30 seconds. 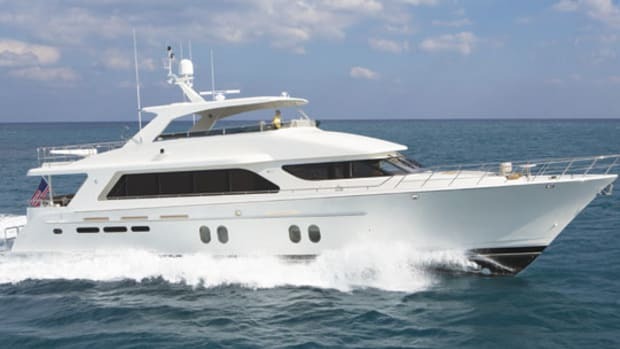 Moving into the cockpit, it’s impossible not to notice the large aft sunpad, but what is easy to miss is the equally large Jacuzzi it conceals. That Jacuzzi can be filled with fresh water or continually pumped seawater, which essentially makes it one big baitwell for humans. The goggle-eyes should be so lucky. The Alpha 76’s saloon is accessible through a sliding glass door that opens nearly completely, and is almost perfectly flush with the cockpit. It also brings some serious “wow” factor and should be one of her main selling points. There’s no other way to say it, the space is simply gorgeous, not to mention huge, thanks to the boat’s wide, 19-foot 5-inch beam. The aft galley is dominated by an expansive, super-modern-looking glass bar that leaves no doubt as to this boat’s entertaining credentials. Meanwhile large, sharply angled side windows let in tons of light—but that’s not all. Thanks to smart glass, at the push of a button the windows can frost or tint to whatever shade you prefer. 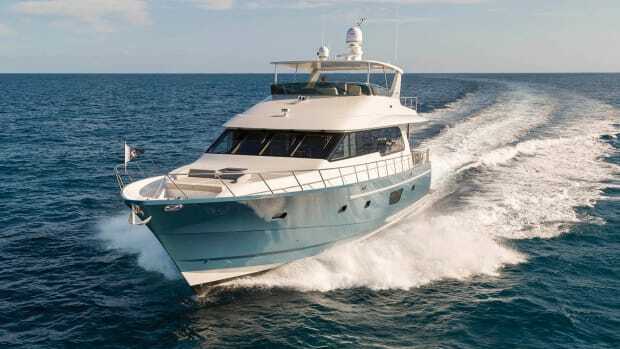 The inner helm boasts one of the traits that makes this boat preferable for a skilled owner/operator, in the form of its InteliSea monitoring program. 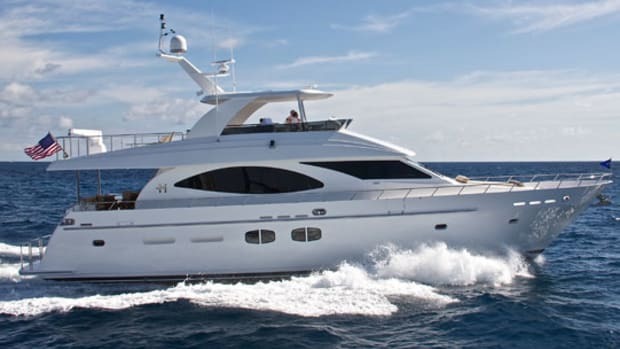 InteliSea is a high-tech, Wi-Fi-enabled program that allows an owner to track veritably all of the boat’s systems as well as her history (tank levels, sea state, etc.) remotely via cell phone. Other onboard highlights that show Cheoy Lee’s dedication to building the best boat possible evince themselves elsewhere. On the flying bridge, there are beefy, stainless steel tubes that support the hardtop. Their welding is seamless and superb. Down on the accommodations level, there’s a full 7 feet 6 inches of headroom in the forepeak VIP. And in the amidships master stateroom’s head, there’s a deep tub lined with marble laid by experienced craftsmen that is a mere 3 millimeters thick, for weight considerations. Three millimeters! Think about the care it must take to work with sheets of rock that thin. The payoff of course, is that, at that thickness, marble is only about 1½ pounds per square foot. The engine room is another boon for the owner/operator, as it is ergonomic and well laid out, with most equipment, including four Racor fuel-water separators, easy to access. The 6 feet 4 inches of headroom down there will be much appreciated I’m sure, as will the heavy sound insulation. Out on the water, it certainly does feel as if the 76’s burly, 1,900-horsepower Caterpillar diesels appreciate their roomy digs. The boat blasted through the 1- and 2-footers with unyielding rigidity thanks in no small part to the hull, which is constructed using fiberglass cloth rolled bow to stern, a technique that yields no break points. At top end, we were moving at a 35.8 knot clip—no small feat. All told, performance-wise she was fast, fun to drive, and responsive to her throttle. 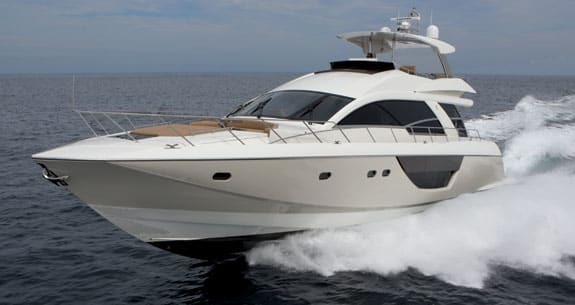 Another plus, if you’d like one of these boats, is that the yard can crank her out in 38 to 44 weeks, in large part because she’s a semicustom boat with a standardized layout. And there’s a whole lot to be said for seeing something you like, and then laying your hands on it within the year. When you couple that quick turnaround time with prices that are quite competitive, you begin to get the whole picture about why Cheoy Lee is so excited about this build. And that’s no myth. Noteworthy Options: Smart glass in saloon ($147,500); Intelisea monitoring system ($103,950); Double Stidd seats at upper and lower helms ($27,800); Humphree Auto Stage 3 Interceptors ($4,000). 600 gal. fuel, 225 gal. water, 6 persons, 85 lb. gear. 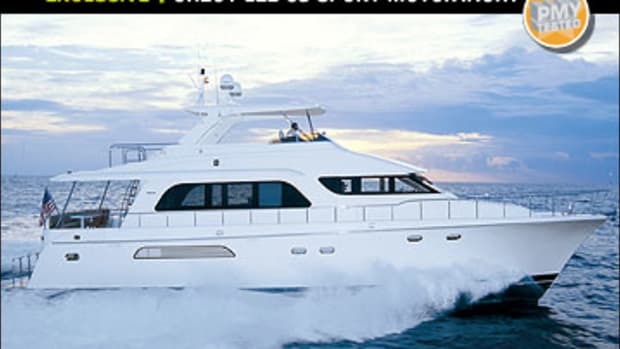 This article originally appeared in the February 2013 issue of Power & Motoryacht magazine.